Captain your look in style with the SKECHERS BOBS Chill Luxe shoe from our charitable shoe collection. 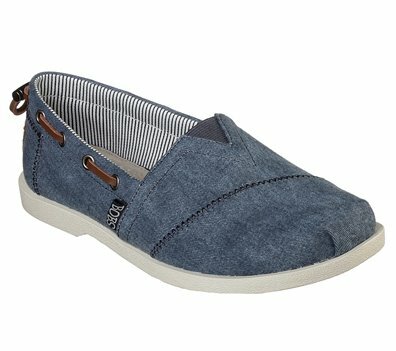 Soft smooth denim fabric upper in a slip on casual alpargata flat with stitching accents and cinch collar. Memory Foam insole. Cute shoe! I have a couple of “Bob’s” shoes and my only complaint with them is that their soles are very flimsy and flexible, I like that the sole of this particular style is much more sturdy and supportive. I normally wear an 8 wide—I need an 8.5 in Bob’s for them to fit comfortably.